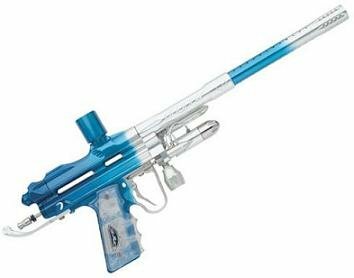 The 2003 DYE Ultralite Autocockers are a unique variance of the standard full size Reflex cocker and feature all of the newest innovations in lightweight cocker technology. The Ultralite offers all of the same features as the Reflex cocker but in a much smaller compact design. Dye has gone the extra distance and eliminated all unnecessary weight, which makes the Ultralite roughly 20% lighter than other traditional cockers. The Ultralite comes with an ultra-thin 45 swing frame and an additional dovetail sight mount. Ultralites come standard with our DYE front end kit, Ultralite barrel, and matching Sticky grip. All Ultralite Cockers are machined from original Bud Orr bodies.